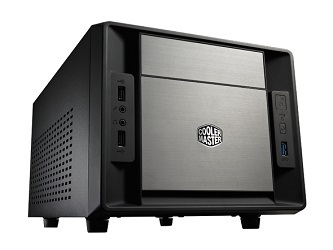 There was a veritable flood of intriguing Mini-ITX cases released this summer, including the Cooler Master Elite 120. Cooler Master took a somewhat conservative apporach with the Elite 120, offering up a fairly conventional shoebox-style case that didn’t rock the boat by eliminating the 5.25″ bay or limiting internal bays to 2.5″ drives. The result is a largish, jack-of-all-trades Mini-ITX case. It may not scream HTPC, but part of the beauty of Cooler Master’s approach is that the Elite 120 will fit into any role. Use it in your home theater stack this year and then pass it off to the kid’s room next year. The Cooler Master Elite 120 might not quite offer the cooling capacity that Cooler Master was hoping for, but with a flexible design and some aggressive pricing, the Elite 120 might just fit the bill for the right setup. The Elite 120 Advanced is about as far from the Cosmos II as you can get and still be considered a “computer case”. Since it’s designed to use a standard ATX power supply and has a full-sized 5.25″ bay, some might argue that it’s on the large end of the mini-ITX case spectrum, and while they’d be right, it’s still pretty tiny in absolute terms.